You’ll need to get an early start if you want to keep up with Olivia DeHavilland! Our roving Greenbriar camera has gone all the way back to April, 1938 (the back caption on most of these stills) to follow our busy Warners contract player as she makes her way through a typical day on The Adventures Of Robin Hood. We’re staying with Olivia through the whole process, so check back throughout the week, as we chart her progress from an early wake-up call to lights out. 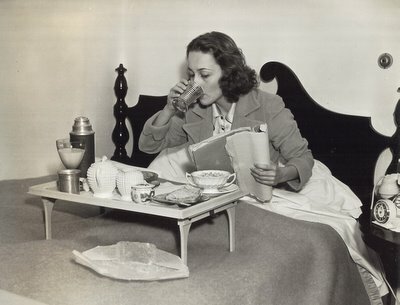 A glass of cold orange juice is on Olivia DeHavilland’s breakfast menu every morning, and she usually studies her lines for the day while drinking it. She is appearing in Warner Bros. Technicolor production of THE ADVENTURES OF ROBIN HOOD. That was the original studio caption that would have accompanied this image in most publications. Our first concern is the time indicated on the alarm clock beside the bed. Either it stopped sometime the night before or Olivia and her employers are practicing a little deception on the fans. In any case, that clock reads 12:09 (or very close to it). We don’t want to appear cynical though, so we’ll let it pass. We are curious about that buzzer on the wall above Olivia’s bed, however. Does she use it to summon her butler … or maid …or her mother? Later captions in the series indicate that Olivia lives with her family, so the question arises --- If Olivia had a butler, or maid, would he or she serve other members of the family as well? Did he or she bring them breakfast in bed? And what about this "breakfast"? It’s indicated she’s drinking orange juice, but what’s in that other glass that looks an awful lot like orange juice? Did the Warners photographer (he’s in the room too, you know) score a glass of that cool fresh beverage from Olivia’s butler and/or maid? Maybe that juice was supposed to be for Joan Fontaine, and she’s going to catch the lensman chugging it down. Could that be where all the trouble started between those feuding sisters? And what’s the paper doing on the bedspread? Looks like they just unwrapped that sandwich, or sweet roll, or apple pie, or whatever it is , and just tossed it on the tray. This whole breakfast thing is starting to look mighty fishy, and by the way, is it necessary to have a thermos of coffee if you’re having breakfast in bed? Maybe she’s getting it ready to take with her to WB. From what we hear, Jack L. was so cheap, he probably didn’t even comp the stars on their morning java fix. Methinks the clock reads 6:09, actually. The hands on the clock are white; there's a little 'clock within a clock' under the 12, the hands of which one could mistake for the hands of the big clock.